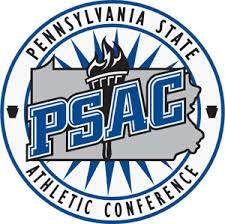 Slippery Rock University football standout Marcus Martin earned the highest academic honor the Pennsylvania State Athletic Conference awards each year when he was named the PSAC Pete Nevins Male Scholar-Athlete of the Year by the league office Tuesday afternoon. The Pete Nevins Scholar-Athlete of the Year honor is awarded annually to one male and one female student-athlete that performed exceptionally well in the classroom and in their field of competition. Martin was one of the most dominant defensive ends in college football last season. He led the nation in both sacks and tackles for loss, finishing with 15.5 sacks and 26.5 TFL, respectively, in just 11 games. Martin broke the NCAA all-time sack record for players from any level, finishing his career with 56.0 sacks. He also broke the all-time NCAA Division II record for tackles for loss with 92.5. Martin shares the 2017-18 award with the female honoree, volleyball player Natalie Cignetti of IUP. Martin signed with the Seattle Seahawks as a fullback after the NFL Draft, but was released on May 30th.